What’s so Forain about this tightrope walker? As a further salute to our Francophile friends! I thought I would showcase a ‘lesser-known’ Impressionist French painter. This is (c.1880) oil on canvas, from the Art Institute of Chicago. Forain, (according to Wikipedia) (23 October 1852 – 11 July 1931) was a French Impressionist painter, lithographer, watercolourist and etcher. Born in Reims, Marne and later from Paris, he began his career working as a caricaturist for several Paris journals including Le Monde Parisien and Le Rire Satirique. He later enrolled at the École des Beaux Arts, studying under Jean-Léon Gérôme as well as another sculptor/painter, Jean-Baptiste Carpeaux. He became friends with Arthur Rimbaud and Verlaine as well as many writers, including Joris-Karl Huysmans, and the painter, Edouard Manet and Edgar Degas at the Café de la Nouvelle Athènes. 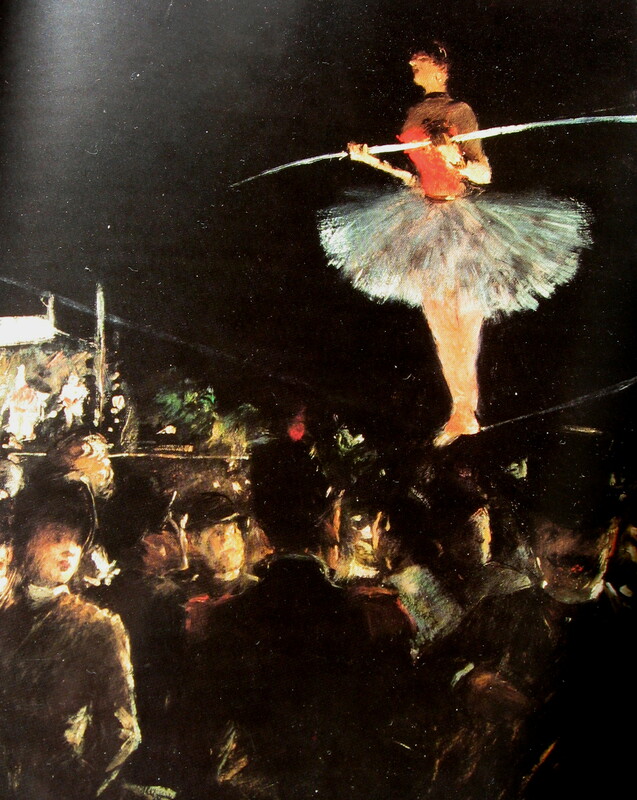 Influenced by ‘Impressionist’ theories on light and colour, he preferred to depict scenes of everyday life: his watercolours, pastels, and paintings focused on Parisian popular entertainments and themes of modernity— the racetrack, the ballet, the comic opera, and bustling cafés, even the odd tutu-wearing trapeze artist. This entry was posted in Paintings, StreetArt, Watercolours and tagged Jean-Louis Forain, Tight-rope walker. Bookmark the permalink.